We carry only the finest brands of muds and wraps. 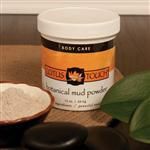 Lotus Touch’s botanical mud contains a blend of kaolin clay, lavender, chamomile, and rose petal powder to draw out impurities, cleanse, calm and nourish the skin. Biotone’s crème-based muds are formulated to firm, tone and detoxify with natural sun-dried rose clay from the Provence region of France, active seaweed varieties, and Organic silts from fresh water lakes in Eastern Europe. Alpha-hydroxyl and amino acids combine to leave skin radiant and soft, while seaweed actives firm and strengthen skin tone. Amber’s classic massage style mud & algae masques are packed with beneficial nutrients that penetrate deeply into skin to flush toxins and leave skin feeling nourished. Choose from French Red Clay, Dead Sea Mud with Chamomile, Seaweed and French Green Clay, Marine Algae and Garden Algae with Mint.